BuxComm is on my do not buy list! If you are considering purchasing the BuxComm B2FD91MP to build your own T2FD you may want to think twice. I do not know about the rest of their products but this one is built far below even the basic standards of your DIY home built. 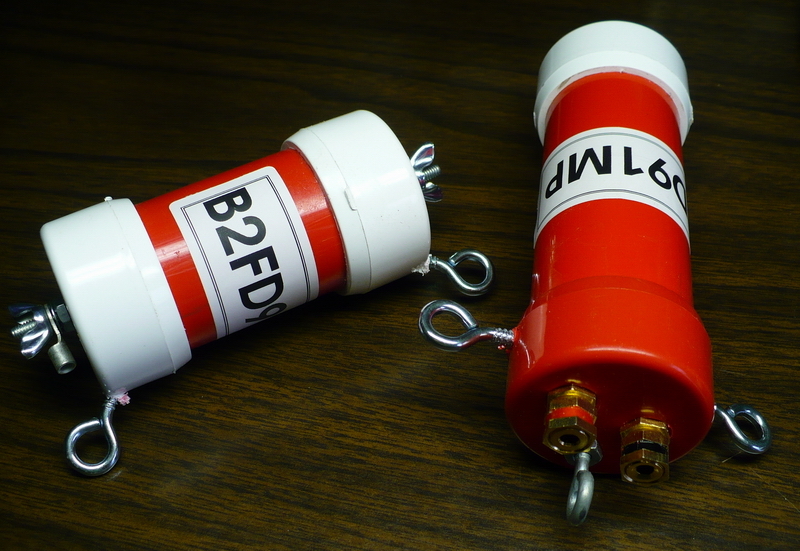 There are a lot of balun's built with PVC pipe and end caps like this product. All I have seen at least use an eye bolt and nut and washer combination as the strain relief point for your wire. Not BuxComm. Both the balun and 450 ohm terminator have small wood screw eye hooks screwed into the PVC end caps! There is no way this rig is going to stay up in the air with 90 plus feet of #14 wire hooked up to it. Don't take my word on this. Checkout the photo below. To add insult to injury note the Radio Shack speaker connectors provided to attach your antenna wire to. Just for kicks I connected a short jumper between the balun and the 450 ohm terminator and ran an SWR curve with my RigExpert AA-54. SWR on the left frequency on the bottom. For comparison below is an LDG RBA-4:1 Balum terminated with 200 Ohms. Clearly the LDG has a better bandwidth with an SWR under 1.5 from 160 through 10 Meters and useable up to 6 Meters. When I received this order I emailed BuxComm my concerns. No reply. I emailed them again for a refund. No reply. So today I called them and asked for a refund. Their answer was, "its out of warranty". How about the 2 emails you never responded to I asked? Well, ok, send them back. There will be a 20% re stocking fee! Thanks I said, I will just keep them and throw them away.